Train Like The Pros with Explosive Performance! Want to know how the Pros Train? Most of the pros in the area come to Explosive Performance for off-season and pre-season training. After an intense season, their bodies are beat up, have formed imbalances, and lack efficient movement patterns. Our goal as professionals is to address their movement quality (mobility) and to build a stable foundation before considering looking at improving power and strength. Let’s be honest these guys are in the NFL because they are already fast and strong!! But if we can improve their movement quality while increasing power and strength, then they will move and feel better on the field. This is will lead to increased movement efficiency and decrease the risk of injury thus allowing them to perform at a higher level longer. As a professional who would not want that! This means a longer and healthier career. To meet these needs every player that meets us will go through an intense screening which provides us with mobility profile (FMS), power profile (vertical), dynamic efficiency (5 Jump Single Leg Test), speed profile (10yd sprint and Curve Max Speed), and upper body strength (upper push/pull movements). From these screenings, we can determine the appropriate amount of soft tissue/mobility work compared to power and strength that each individual athlete needs. In order to bridge the gap of movement efficiency and power/strength we like to incorporate movement skills into the training. 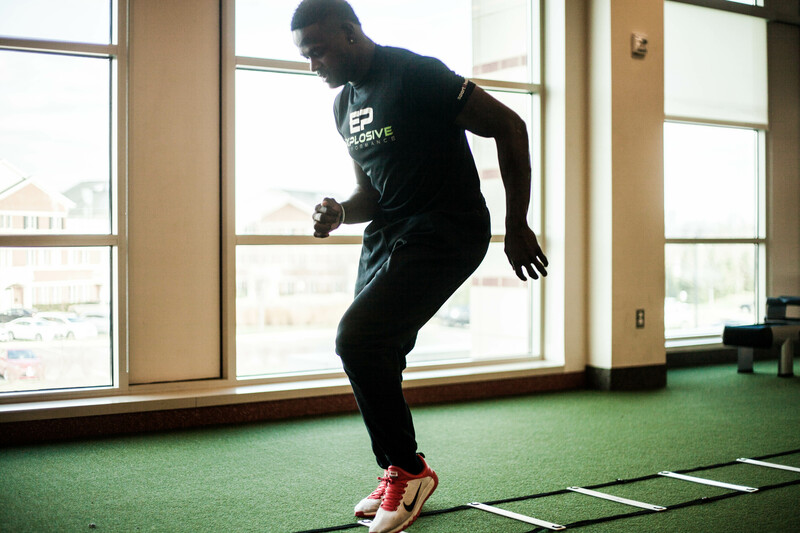 This teaches the athlete to utilize his new mobility with his increased power gained throughout the training. Once we bridge this gap, we like to use Keiser Equipment to give us power (watts) readings to measure the efficiency of the players movement in each rep, if our athletes are able to produce more power without increasing weight then we have improved efficiency without overloading our athlete. This past off-season we had local town hero Alex Carter (CB) of the Detroit Lions (son of former Redskins player Tom Carter) and Rashad Ross (former Redskins WR) come to us to prepare. Alex has had a few injury prone seasons and was ready to make a change, while Rashad was looking to gain some strength without losing his ability to move fast on the field. We took them through our methodology and they are ready more than ever this upcoming season. We wish them both and all professionals in the area best of luck to the upcoming season.